Dessert Dips are always the perfect way to wrap up a party! Some of our other favorites are our Brownie Batter Dip and our Banana Cream Pie Dip! They are both ALWAYS a hit! We love S’mores! To my family s’mores means that summer has finally arrived. However, living in Michigan, we don’t always want to wait for summer to enjoy all of the deliciousness wrapped up in a s’more! That’s were S’mores Dip comes into play. 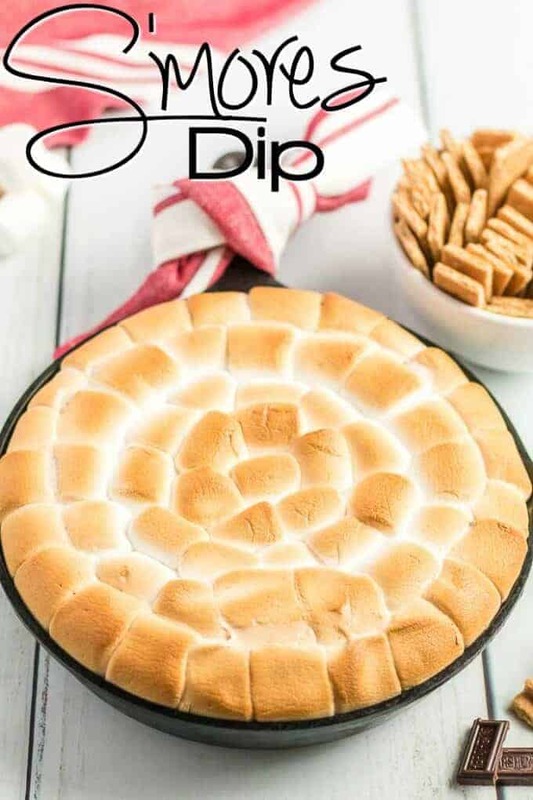 Game changer – you can have s’mores all year round with this quick and simple homemade s’mores dip recipe! That’s right – we are making s’mores in the oven! There is just something about s’mores that brings my inner camping child out. Maybe it’s the fluffy toasted marshmallows combined with the melted milk chocolate and smooshed between two crunchy graham crackers! Well now I can enjoy my s’mores all year round and I couldn’t be happier! 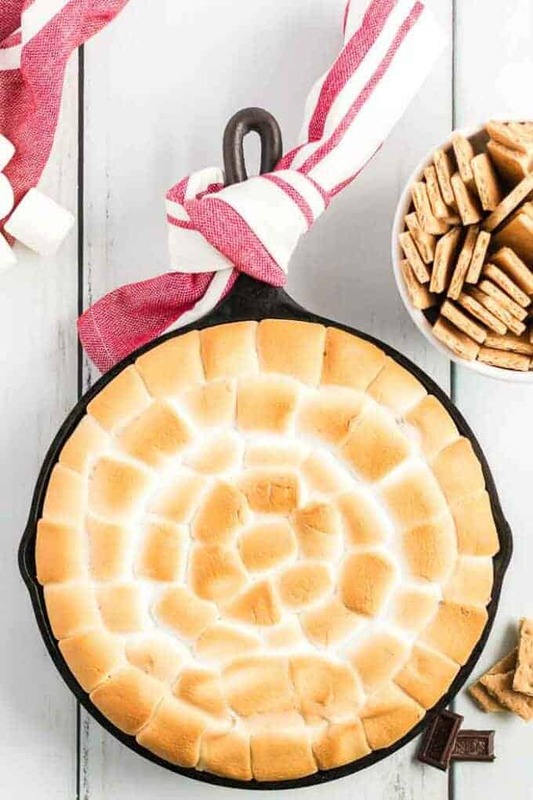 You really don’t need anything more to make s’mores dip than what you would use in classic s’mores! 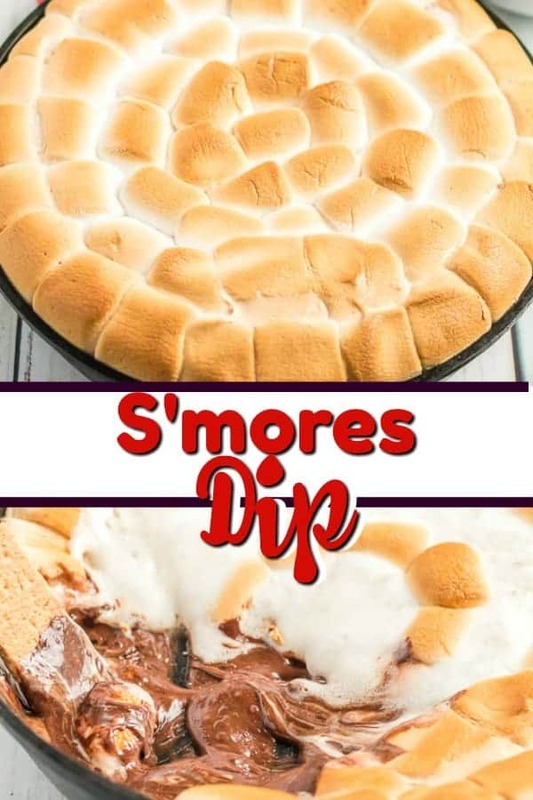 I have heard of some people using marshmallow fluff or marshmallow creme to make smores dip, but we prefer using the classic chocolate and marshmallow combination! 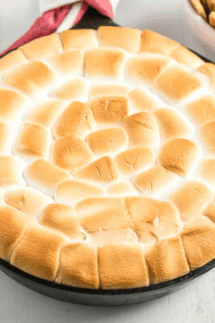 We used a cast iron skillet or pan for our recipe, but you if you don’t have one, you can still make this s’mores dip without a skillet, just use a regular baking dish. You just lose a little of the WOW factor! Not sure why, but it just looks so cool in the cast iron pan! 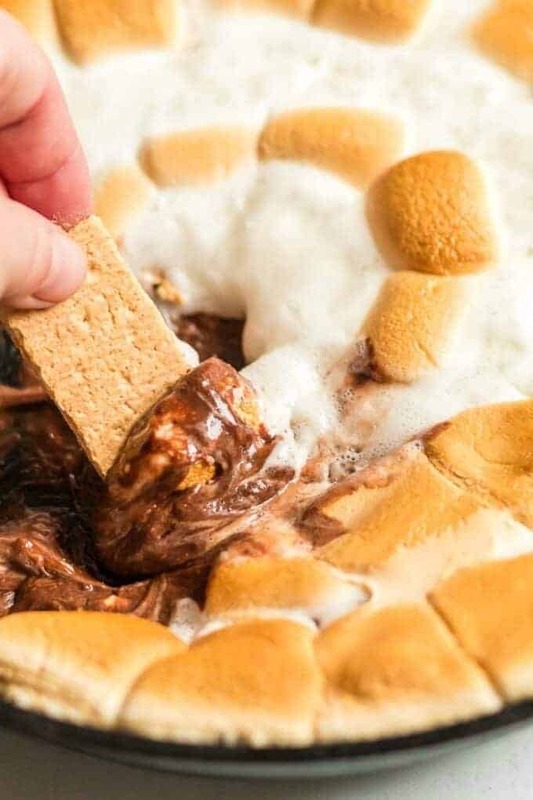 It couldn’t be any easier to make s’mores dip! 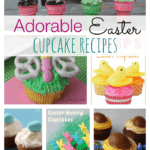 First, you will want to preheat your oven to 400 degrees and grease your cast iron skillet or your baking dish. Then place the chocolate in a single layer along the bottom of the pan. Top the chocolate with the marshmallows. I like to line them up if using a square dish or create circles with them if using a round skillet. Fill them in completely. Remove the pan from the oven and let it cool for about 5 minutes. 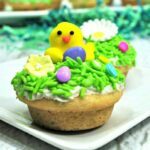 Serve right in your baking dish. 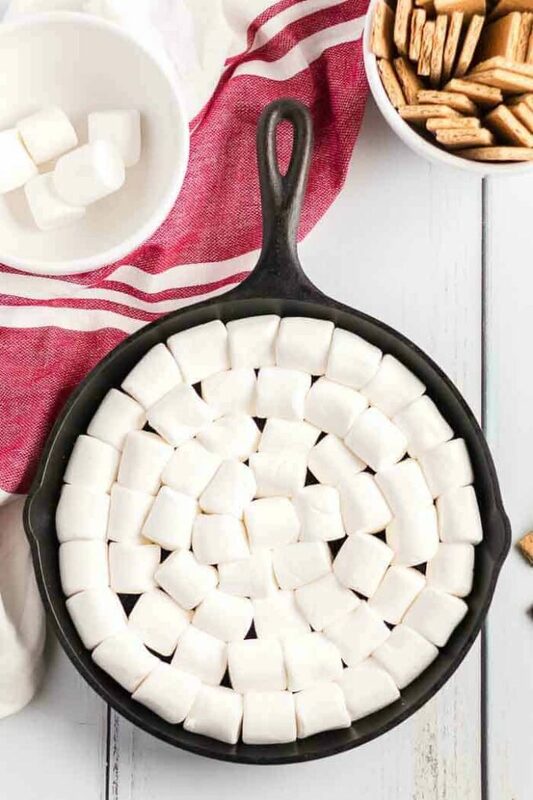 What to dip in s’mores dip? Another great thing about making s’mores into a dip is that you are dipping, not sandwiching! This opens up a world of possibilities with what you can pair your s’mores with! Dipping is so much easier than layer and trying to bite into a heaping s’more sandwich! Here are some of our favorite things to dip in s’mores dip! Campfire Cones – MUST TRY! S’mores Bites – TRY to eat just one! S’mores Snack Mix – Addictive! 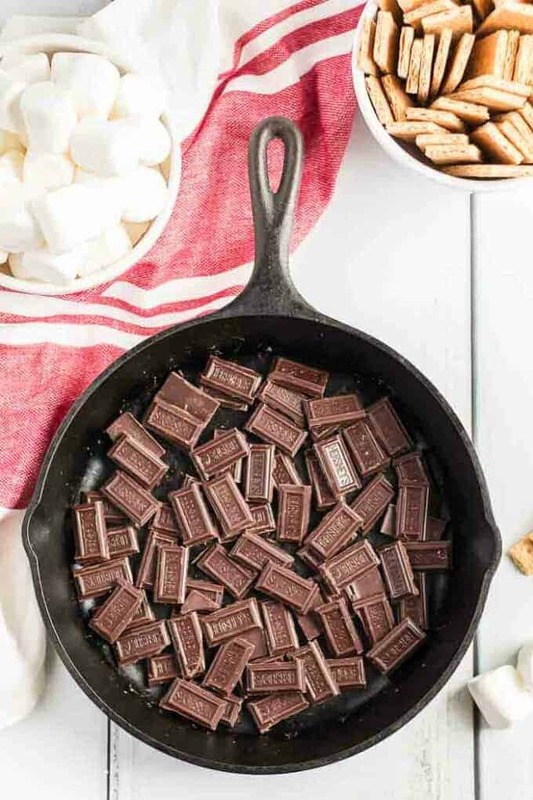 Place chocolate in a single layer along the bottom of the pan or dish. Top the chocolate with marshmallows. Place in the oven for 10 - 15 minutes, until marshmallows are golden. Watch carefully because the marshmallows can burn. Let sit and cool for about 5 minutes, then serve directly in baking dish. Serve with graham crackers, fruit, cookies, pretzels or crackers for dipping.